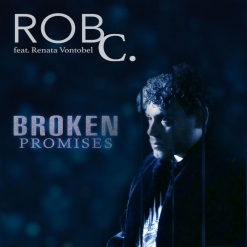 “Broken Promises” is the first single release as a solo artist from Rob C, a keyboardist/ pianist/ composer from Chile who has been in Los Angeles for the past two years working to establish a career in performance and composition. He has created and arranged music in a variety of styles that include Latin folk, Tango, rock, fusion and electro pop (the closest category for “Broken Promises”). Rob C’s plans include creating a full album of electro pop that sometimes includes Chilean folk rhythms - an interesting project, indeed! Rob C wrote the music and lyrics for “Broken Promises,” plays all keyboards and does some of the background vocals. The lead vocals are by Renata Vontobel, a singer from Brazil who is also currently living in Los Angeles. The song has a driving rhythm, poetic lyrics that are deeply emotional, a melody that is catchy and accessible, and instrumentation that is more sophisticated than many other pop recordings. I can’t wait to hear more music from this very promising emerging artist! “Broken Promises” is available from Amazon and iTunes as well as all streaming sites.